Disclaimer: First I would like to say that if the inclusion of parts of code is a problem for the Hikashop creators, I apologize and I will remove it promptly. Just let me know. Step 2: In the module page make sure you assign it to a position (I chose the [menu]) and in the Hikashop tab select the Minicart [Dropdown cart] option. 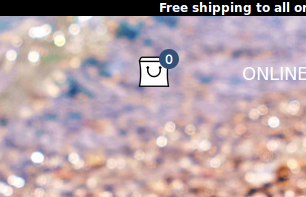 Depending on what you want to show in the drop down of the minicart select product image, proceed button, product name, delete button, coupon, shipping. Make sure the "Product Quantities" are set to [YES] if you want to show total number of products and not the price and the "Hide if empty" to [Default]. CART_EMPTY="<img src=' http://website.com/path/to/empty-cart/image/empty-cart-image.png '  width="40" height="40" /><br/>%s"
Click Save at the top of the popup and then the green Joomla save. Then its only a matter of css to make it look beautiful. I hope someone finds this helpful. Let me know if you have any problems or if the code doesnt work for you (it should, though). One thing though I don't understand is why not use only translation overrides ? You could have added the img tags in each translation override, added a span with a class around the %s and you wouldn't have needed any view override in that case. All that would be left would be some CSS to style the elements. That would be more resilient for future modifications of HikaShop since it wouldn't require a view override. But maybe I'm missing something having only a quick look at your code changes. Thank you for checking it. Originally I went through the override, adding span, as it was proposed in another thread. The problem was that it forced the icon of the cart to the dimensions of the span of the number of cart items (i.e. very small) so I checked it with firefox and tried a number of css stuff (even with !important) to make the cart icon resume its set size, but to no avail. So as I was playing around with the code in firefox I dragged and dropped the image tag outside of the span and thus the extend of the override. It worked like a charm. It was then that I realized that I the image would need to be completely out of the influence of the span in order to be displaying properly. In all honestly I hope this feature (or the ability to show the minicart in the same form as my modifications allow) will be one of the options in Hikashop in the future. Note#1: In the future perhaps through the configuration menu I could have an option to select our cart images and the path to replace the $cartimg. Last edit: 1 year 5 months ago by jgardounis. Thank you for your feedback. A default easy way to have an icon cart module could be good in the future yes. We'll look into it. I can only confirm that I would also like to see this as native display option. + a setting to define the cart/bag image path in the hikashop cart module settings.
. Show i wonder why it is not working when the cart is empty. Also i want same guides in order to change the counter position and style. it would seem like the path for the empty cart might not be set. Have you done step 3 in my post? CART_EMPTY="<img src=' website.com/path/to/empty-cart/image/empty-cart-image.png ' width="40" height="40" /><br/>%s"
i have make all the steps as you say. I have copy and paste the step 3 in the override i have change the image path, i have diferent image for empty and full cart but when is empty i take only zero. Can you provide an Url link in order to see by ourself your result, so far it's hard to see what can be the root issue. Last edit: 11 months 1 week ago by Philip. Can you show us a screenshot of where you have added that line ? i have attache the photo. I believe i have put in the right way. I have also try anther compassion and still not working when the cart is empty. 1 - You have spaces in the "src". 2 - You are using double quotes for the "height" and "width" when you MUST use single quotes to not break the language override. The translations are enclosed in double quotes. You should keep them while translating and not add double quotes in the string when modifying a translation as that would break the file.